It is not in the character of Rivers State APC to react to obvious misgiving innuendos from Rivers PDP in her desire to look for cheap publicity but attempting in one of their recent press statements in which she titled, “Rivers PDP Dares Dakuku over Wike” to disparage and compare Dr. Dakuku Peterside the President of the Association of African Maritime Administrations (AAMA) with Governor Nyesom Wike of Rivers State is to us a joke taken too far. The party in a statement approved for circulation to the public by her State Chairman, Chief (Dr) Davies Ibiamu Ikanya in Port Harcourt on Tuesday reasoned that the only crime that Dr. Dakuku Peterside committed to warrant this unguided and uncouth reaction from the PDP was his caution against the plot by Governor Wike and his government to disrupt the flag-off of the Bonny-Bodo Road by the Federal Government and dared him that if he carries on with such an evil plot to disrupt a project that have been denied the State for over 40 years that he (Dakuku) will lead a protest against such a sinister plot. What is the crime that a concerned son of Rivers should show concern over a plot to under develop Rivers State? Not minding the misgiving on the side of PDP in this regard, we commend and congratulate Dakuku for this proactive caution which if not, Wike wouldn’t have ran away and avoided the flag-off to show his disdain and discontentment over the APC led Federal Government drive to develop Rivers State. The party reasons that for Wike to have distanced himself from this great event aimed at addressing one of the lingering challenges facing the State exposes him as an unserious leader. The party further questioned, the rationale behind comparing Wike who abandoned our medical students who are in their final year of study stranded in foreign land and preferred to travel to Spain to pursue setting up of Real Madrid Football Academy as a means to loot and launder our hard earned funds outside the country with Dr Peterside who instituted private scholarship scheme to ensure the education of our students within and outside Nigeria. The party queries, how does one compares Wike a fellow bereft of leadership ideas who is a misfortune in the governance of Rivers State with a patriotic son of Rivers State in the stature of Dr. Dakuku Peterside whom we all know has a well-documented blueprint which he tagged ‘Road To Prosperity’ that would have made Rivers State one of the most developed states in Nigeria by now is to us exhibition of ignoramus to the highest order on the side of the Obu led PDP in Rivers State. How does one compare a Governor that could not build on the feats of his immediate predecessor, Rt. Hon. Chibuike Rotimi Amaechi in the areas of Agriculture, Roads, solid infrastructure, security, education, health but instead performed so woefully that today Rivers State is now known as Rivers State of blood and Port Harcourt its State capital the den of garbage with Dr. Peterside, a former ranking member of the Federal House of Representatives, who in so short a time made NIMASA an institutionalised institution with the right structure, the right work ethics; an institution which Nigerians are proud of. While Wike has ran the economy of Rivers State aground without any budgetary law in running the affairs of the State on the other hand, today, NIMASA under Dr. Dakuku is a model of reference on the continent of Africa, an agency that understands that it is set up to serve the Nigerian people, ensured the full implementation and enforcement of the International Ships and Ports Facility Security (ISPS) code in the nation’s ports, and shut three jetties and port facilities for non-compliance with the provisions of the ISPS Code. The party could not understand how one could compare Wike who has turned Rivers State into a slaughtering, mourning field and Rivers of blood with Dr Peterside who is an astute and seasoned administrator with a Midas touch who has repositioned and turned around the fortunes of NIMASA, AAMA and whatever challenge(s) he comes across with? 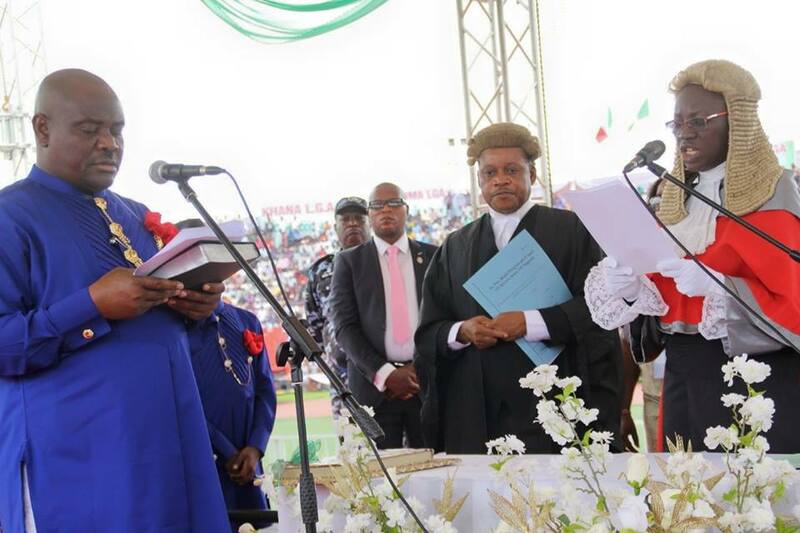 Today, while Wike wastes Rivers State funds on issues of no interest to the people of Rivers State thereby owing our civil servants months of salaries and our Pensioners arrears in their entitlements but on the other hand, Dr Dakuku Peterisde within less than two years in office has for the first time made NIMASA to remits N21.805bn to Federal Government Coffers. The party was infuriated on how any sound group could compare Dakuku with Wike knowing that doing so will amount to comparing darkness (Wike) with Peterside (Light). We are all aware of the circumstances in which Wike ascended the office of the Governor of Rivers State as we also know that if the election was conducted fairly and on a level playing ground, Wike would have lost so woefully to a better, well-equipped and superior Peterside. Wike’s unpreparedness for governance is so visible that Rivers State has become a laughing stock before other States in Nigeria. The party notes with proud that NIMASA under Peterside’s watch has commenced the full implementation of the Coastal and Inland Shipping Act 2003, also known as the Cabotage Act, and forged strategic partnerships with the Nigerian Air Force as well as other naval assets to patrol and monitor the country’s waterways with a view to enhancing maritime security by decisively tackling piracy and criminality on the high seas while on the other hand, Wike is doing all within his powers to empower criminals and sabotage the efforts of Police and other Security agencies in the State to sustain the State as Rivers of blood. While Dr. Peterside has proved himself a worthy ambassador of Rivers State and Africa as a whole, Wike on the other hand is fast becoming notorious in ensuring that Rivers State is unsafe for investors to invest in the State. The party notes that comparing such a fellow like Wike with a figure that has become not only as an Institution but a respected acknowledged International figure is a misplaced comparison. In case that the Obu led PDP have forgotten, Dr Dakuku Adol Peterside apart from being the Director-General of the Nigerian Maritime Administration and Safety Agency (NIMASA) is also the first Nigerian to be elected as the Chairman and President of the Association of African Maritime Administrations (AAMA) which was a testimony to his exceptional leadership qualities. The party notes with sadness that Wike who could infringe this type of punishment on our best of brains is not fit to govern any State in any civilised society. With these facts, it is foolhardy to compare such a Disaster who struggled to graduate from the University with Dr Peterside who is a PhD Holder. The party warned her PDP counterpart to desist from any further attempt to blackmail or disparage any of her principal stakeholders as the party will no longer tolerate such an unwarranted strategy anymore.